Plant Parenthood Can be Tricky! But Don't Worry We Are Here To Help! Plant Parents Most Common Questions and Answers! Don't See Your Question ask! Plants are an easy way to add color, energy and transform your space, but which plant is right for you? Choosing the right plant will depend on your style preference, the size of your space and your home or office environment along with the time and effort you can dedicate to caring for your new plant. Do a little self check and see what you come up with. This will allow you to choose a plant that best suites you. Still not sure on where to start of what type of plant you want ask! We are here to help you succeed every step of the way! I’m a new plant owner. What should I do first? Some experts suggest repotting your plant. Most plants are often sold in nursery pots or plastic containers which may not exactly fit the decor vibes of your space an do not allow the plant to get adequate water. They may also be too small for your plant. To repot, choose a pot 1-3 inches larger than the original container. The color, style and fabrication is totally up to you as long as the pot has proper drainage holes. Adding a pop of color i is a great way to bring new energy to a space and create a nice flow to your space. When should I repot my plant? Repotting is recommended for all plants. We encourage repotting because plants are often sold overgrown and are not meant to live in the plastic grow pots they're sold in. You can either repot entirely or change the soil out, but you should only change the soil out if the plant has not outgrown current pot size. If you notice roots poking out of drainage holes, it’s a sign you need to repot. How often should I change my plant’s potting mix? In a year or two, you can change the potting mix out if your plant has not overgrown its current planter. Small doses of nutrient-rich fertilizer may also be enough to get your potting mix back in tip top shape. Keep in mind that if you use good organic soil and proper organic fertilizers for your plant you should not need change out the soil as often. Can my plant thrive in artificial light? As long as you have the right bulbs. Plants respond best to sunlight, so you’ll want a bulb that fills color and intensity requirements. Most regular bulbs, like the ones in your light fixtures, aren’t sufficient because they produce mostly green light. Green plants reflect green light away instead of absorbing it, so it’s pretty useless to them. Colors like blue, green-blue, yellow-orange and red — especially red light — maximize photosynthesis and other vital functions. White LED lights are fine, but spiral-shaped, white Compact Fluorescent Lamps (CFLs) are best. To get the right intensity, check your bulb’s Lumen count: the higher the better. For example, if your plants require lots of light, opt for a bulb or bulbs which total 3000 lumens or more. What does pale green growth mean? If your plant has pale green growth and is losing leaves, this is a sign that the plant needs more sunlight. Your plant can’t sustain the green chloroplasts that gives its rich green color with low light. What do yellow leaves mean? If your plant has yellow leaves, this can be normal. Some plants may yellow and shed leaves as part of their natural process. If your plant is new, yellow leaves might indicate your plant is stressing out or has gone into shock. Yes just like people and animals, plants can get stressed too, especially when they’re moved into a new environment or repotted. Give your new plant a week or so to get used to its new home, and make sure it is getting adequate water and light. If you’ve had your plant for a while, yellow leaves can be a sign of too much 'kindness' like overwatering, or a lack of "kindness" and may need more water than it’s getting or more nutrients. Organic fertilizer can help with bringing a sick or sad plant back to health. What causes brown leaves on plants? Plants turn brown likely because they’re getting too much (sunlight, over-fertilizing) or too little (under watering or low humidity). If you want to water more often, go gradually taking care to not overwater a dry plant (moderation is key). Try raising the humidity levels with a humidifier or by grouping plants together. For a gentle increase in humidity, rest plants on top of a water filled tray lined with rocks or place plants in a glass case with the lid slightly open. If your brown plant is close to a light source, give it a little more shade especially when the sun is strongest (i.e., midday, during summer months.) If you’ve recently fertilized your plant and it turns brown you may have simply used too much. Leach the pot by running it under tepid water, rinsing it clean of excess fertilizer. What causes brown spots on plants? 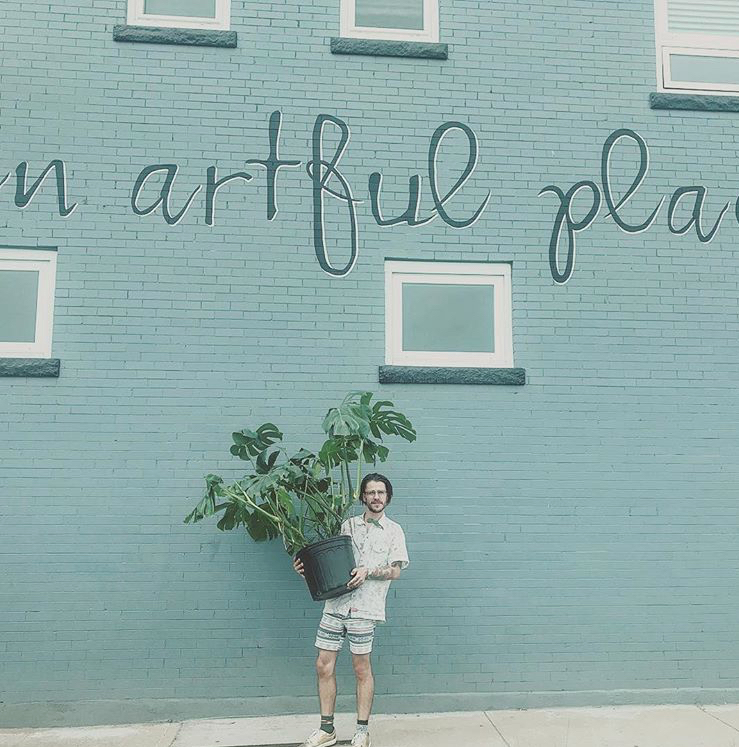 Specifically on fiddle leaf figs — finicky plants recommended for the seasoned green thumbs among us — we’re betting your grandma has one and if she saw brown spots, she would tell you that most fiddle leaf figs experience leaf damage before you buy them and once damaged, there’s not much you can do. But no need to worry, as long as the brown spots do not spread. Why does my plant look dirty? It’s normal. Indoor dust can accumulate on leaves. Make sure it’s not a sign of pests. For delicate plants, wipe leaves clean with a damp cloth. Regular cleaning of plants will also help them grow! Plants feed through their leaves and when they are covered in dust it makes it hard to eat. So regular cleanings are recommended. Why is my plant leaning? If your plant is leaning, access how much your plant is leaning (a little or a lot?) A little lean is totally normal because, gravity. Extreme lean, not so much. Both can be corrected with the right amount of sunlight and rotation. Remember, plants grow towards sunlight. To fix a slight lean, try rotating your plant every few weeks. If your plant is leaning a lot and you notice new growth to be smaller, pale and spindly, it needs even more sunlight. Try moving your plant closer to the light source and rotate every time you water. If your lean becomes extreme, it could be a deeper-rooted problem: root rot, improper potting and outgrowing the pot are common causes. In these cases, your plant needs to be repotted. Why is my plant wilting? If your plant leaves are wilting or curling inwards, your plant needs a drink. Water it and see if it perks up. It may take just 5 minutes or up to 1 day to notice improvement. Remember to water your plant moderately to avoid overwatering and underwatering. Why does my plant look misshapen? If your plant’s leaves look misshapen in rare cases, your plant may be lacking nutrition. The solution? A good fertilizer. You can use any general purpose fertilizer with an NPK rating. That’s N for nitrogen, P for phosphorus and K for potassium. Check the label for a 10-10-10 NPK rating. We recommend dissolvable crystals or liquid fertilizers that you can easily add when you water your plant. Always follow the instructions provided. Why are my plant’s leaves dropping? A plant that drops leaves is either over or under watered, is under stress because of temperature changes, is lacking of nutrients or most likely needs more light. Plants need light to make food and not enough light means not enough food for the plant. Leaves will start to drop in an attempt to let more light in. Try moving your plant to a more lit area and see how it does over the next few days. What does a thinning plant mean? A thinning plant is a common problem is caused when the top bud, also known as the ‘terminal’ bud expresses “apical dominance”. What’s that? It’s when the top buds produce a plant hormone called ‘auxin’, suppressing side bud growth. To make your plant bushier, simply snip the top buds from your plant, giving room for lateral buds to thrive once more. If you need to cut off leaves, cut at the base where the leaf stalk diverges from the stem/other leaf stocks to ensure healthy regrowth. Will my plant's leaves regenerate? Plant leaves do not have the capacity to regenerate. When a leaf is diseased or damaged, the plant will eventually drop the leaf and replace it with a new one. 2. Your soil may have come in contact with a liquid other than water. 3. Your plants roots are rotten. If your soil is low quality or you’ve had your plant for at least 12 months, it may time to replace the soil. Root rot can create foul odors too, caused by overwatering your plant over time. Rot is easy to spot on the plant itself. Cut away rotted parts of the plant. If no rot is visible on the plant itself, it may be on the roots. Unpot your plant and look for blackened roots — this indicates rot. If mild, simply trim the rotted roots away and repot your plant. Plants with all-over root rot are harder to recover. As an example, Rosette-form plants tend to never recover from root rot. Tip: Stinky plants might be a sign of rot. If you notice a white crust forming inside your pot, it could be normal mineral buildup that occurs over time, a sign of over-fertilization or mold (this means you have healthy soil). White crust is generally harmless, meaning you don’t have to get rid of it, but if you want to, you can dilute lemon juice or vinegar in water (a 1 to 5 ratio) to effectively and naturally dissolve the salts. Water alone will not get rid of buildup. What’s up with these mushrooms? Much like white crust, mushrooms (Basidiomycetes) are generally not harmful fungi. If you see some mushroom growth, you have a healthy, diverse soil. Mushrooms are known to form beneficial relationships with plants and they have learned to coexist in the wild. We recommend leaving the fungi as is, in the soil. If mushrooms are unsightly, your best bet is changing the soil completely. This is only somewhat effective as there may be residual mycelium invisibly dispersed throughout the soil and may regenerate new mushrooms. To avoid future mushroom growth, keep your new soil drier, as fungus thrives in consistently moist conditions.